The new system of carts and friction pads will let students do their own physics experiments. Vernier Software & Technology has launched a new system of carts and friction pads designed to help students perform hands-on experiments in order to learn physics concepts. 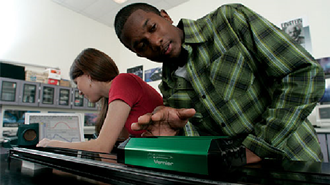 Vernier's Dynamics Cart and Track System allows students to explore kinematics, dynamics, momentum and energy. Each system includes a track, two carts, an ultra pulley and all of the necessary attachment accessories. The systems can also be easily adapted to study optics, color and diffraction. The two new carts — a standard cart and a plunger cart — can be reconfigured for different experiments by attaching various sensors and using magnets or spring-loaded plungers. Side mass trays make it possible to adjust total mass. The stand-alone system will retail for $239. For $384, students can also get a Vernier Motion Encoder System that captures more motion data than a traditional ultrasonic motion detector. Other accessories that can be purchased separately include a bumper and launcher kit, fan cart, friction pad and an entire options ecosystem. The new system is particularly suitable for studying Newton's second law, acceleration on an inclined plane and conservation of momentum. "This new next-generation system helps students conduct engaging, hands-on investigations while learning key physics concepts," said Vernier Software and Technology CEO John Wheeler. "Improving upon the design of our current dynamics system, the new technology provides both teachers and students with an extremely durable, flexible and customizable solution to collect and analyze a wide variety of physics-related data."